Dr. George Kroker and his nurse, Sorrel Wunderlin, are set to retire the first week of April. ONALASKA, WI – For the past 38 years, patients with a host of allergy-related diseases have traveled to our community from around the country to have their lives changed. Dr. George Kroker has treated patients at Allergy Associates of La Crosse (AAOL) since its earlier days, and has provided an unparalleled level of care for his patients, so much so that many have left in tears after wishing Kroker into his retirement. Kroker and his nurse Sorrel Wunderlin are set to retire the first week of April. After being trained under Theron Randolph — an innovator in the allergy world — Kroker connected with Dr. David Morris, founder of AAOL. The two had similar ideals: treat the cause of allergy related illnesses – rather than mask the symptoms — simply, safely, and effectively. Kroker moved to La Crosse from Chicago in 1981 to treat allergy with sublingual immunotherapy alongside Morris. He was the first full-time allergist to be hired to AAOL. Kessler has heard these praises as well, along with patients hoping for ways to give back to someone who impacted them so profoundly. “I’ve had patients contact me about making contributions to research foundations on his behalf. It’s pretty amazing,” Kessler says. One patient made a quilt for Dr. Kroker. Others have taken photos with their humble doctor. Cards and gifts cover his modest office. “When you’re a young doctor, you’re eager to make your mark. You’ve got all of these diplomas up on the wall. But over time you find how much more important it is to get that reward feeling from patients. We have been blessed to get a lot of cards and letters from patients, and they’re very gratifying to read,” Kroker states. Throughout his time as an allergist, he has not only impacted patients directly, but has contributed to research on a variety of allergy related topics; he has had a particular interest in Candida-related illnesses and contributed a chapter on the subject in the textbook “Food Allergy” edited by Jonathan Brostoff. 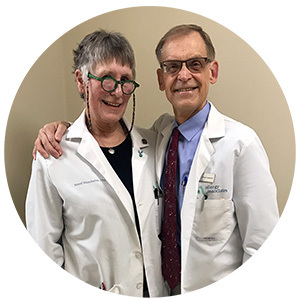 In addition, he worked alongside other AAOL providers to author the La Crosse Method™ Protocol, a standard of sublingual immunotherapy that is used widely across the United States by thousands of providers.